Baked Haddock with Lemon Dill Aïoli is easy, delicious and fast. Ready in under an hour fast. Baked haddock is topped with a light topping of dry bread crumbs, butter and spices. The addition of lemon zest and juice adds a light citrus taste. You really don’t need to add the bread topping, we opted for a sprinkling of dried dill weed and lemon zest but feel free to do so. However, the primary flavor comes from the lemony, delicious dill aïoli sauce. Aïoli [ay-OH-lee; i-OH-lee] A strongly flavored garlic mayonnaise from the Provence region of southern France. It’s a popular accompaniment for fish, meats and vegetables. In other words, its a strong, garlicky flavored, glorified mayonnaise. 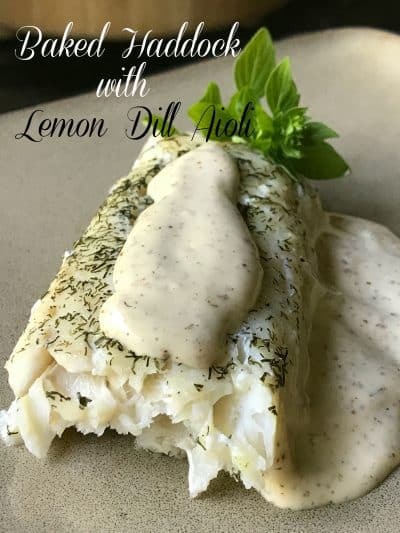 There are many variations for aïoli and many decent brands on the market, such as Stonewall We really like this recipe for lemon dill aïoli sauce because it goes beautifully with any type of fish. Haddock [HAD-uhk] is a saltwater fish that is closely related to but smaller than cod. The lowfat haddock has a firm texture and mild flavor. It can weigh anywhere from 2 to 6 pounds and is available fresh either whole or in fillets and steaks and frozen in fillets and steaks. 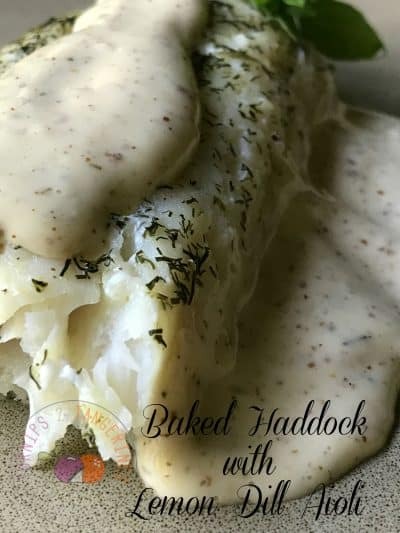 Haddock is suitable for any style of preparation including baking, poaching, sautéing and grilling. Smoked haddock is called Finnan Haddie. Baked Haddock with Lemon Dill Aioli is best served as simply as possible. Baked haddock is always delicious served with cole slaw. Add a side of Smashed Multicolored Little Potatoes and maybe some Easy Cheesy Cauliflower. 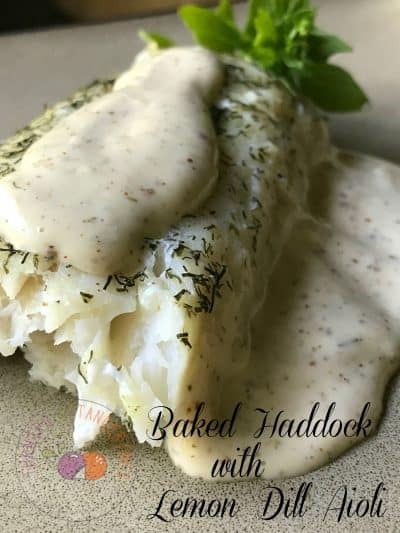 An Easy Baked Haddock Recipe served with a Delicious Aioli Sauce. The sauce can be easily whipped up while the fish is baking. Cut fish fillets into serving pieces. Place in a lightly greased 11 x 7-inch baking dish. Combine remaining ingredients; sprinkle over fish. Bake at 350 for 30-45 minutes or until fish flakes easily with a fork. Meanwhile make Aioli Sauce. Stir together mayonnaise and remaining ingredients. Cover and chill. Sauce can be kept for up to 3 days in the refrigerator. Here at Turnips 2 Tangerines we like our haddock. In fact, we have several recipes using this mild tasting, low-fat, relatively inexpensive fish. Give a few or all of these delicious recipes for haddock a try. 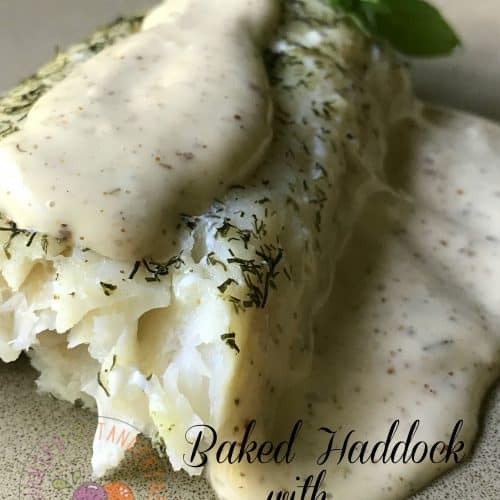 Easy Lemon Haddock, Baked Haddock with Creamed Leeks , Baked Haddock Dinner, & Creamy Haddock Chowder.